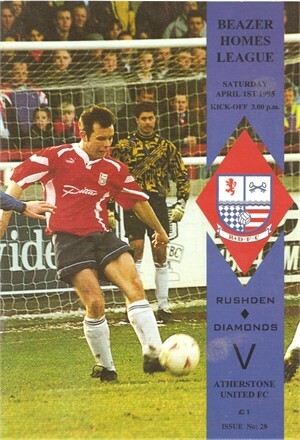 The South Stand at Nene Park, adjoining the Diamond Centre, was fully operational prior to the 1994/95 season when Peterborough United were defeated in the NFA Maunsell Cup prior to the start of the league programme. The league season commenced with a 2-0 defeat by eventual Southern League Premier Division runners-up Cheltenham Town. After an early FA Cup exit, the hoped-for promotion was overshadowed by an excellent FA Trophy run, eventually ended by a 2-1 two-legged semi-final defeat at the hands of GM Conference runners-up Woking. The West Terrace, named the Peter DeBanke Terrace in memory of a former player and respected servant of both Rushden Town and Irthlingborough Diamonds, and capable of accommodating 1,800 spectators, was opened during the 1994/95 season leaving only the East Terrace uncovered.